This is a leet o wather records, a leet o the maist extreme occurrences o wather phenomena for various categories. The staundart measurin condeetions for temperatur are in the air, 1.5 meters abuin the grund, an shielded frae direct sunlicht (hence the term, x degrees "in the shade"). The follaein leets include aw offeecially confirmed claims measurt bi those methods. Temperaturs measured directly on the grund mey exceed air temperaturs bi 30 tae 50 °C. A grund temperature o 84 °C (183.2 °F) haes been recordit in Port Sudan, Sudan. A grund temperatur o 93.9 °C (201 °F) wis recordit in Furnace Creek, Death Valley, Californie, USA on 15 Julie 1972; this mey be the heichest naitural grund surface temperatur ever recordit. The theoretical maximum possible grund surface temperatur haes been estimatit tae be atween 90 and 100 °C for dry, darkish siles o law thermal conductivity. Satellite measurements o grund temperature taken atween 2003 an 2009, taken wi the MODIS infrared spectroradiometer on the Aqua satellite, foond a maximum temperatur o 70.7 °C (159.3 °F), which wis recorded in 2005 in the Lut Desert, Iran. The Lut Desert wis an aa foond tae hae the heichest maximum temperatur in 5 o the 7 years measurt (2004, 2005, 2006, 2007 an 2009.) Thir measurements reflect averages ower a lairge region an sae are lawer than the maximum pynt surface temperatur. Satellite measurements o the surface temperatur o Antarctica, taken atween 1982 an 2013, foond a cauldest temperatur o −93.2 °C (−136 °F) on 10 August 2010, at 81°48′S 59°18′E﻿ / ﻿81.8°S 59.3°E﻿ / -81.8; 59.3. Althou this is nae comparable tae an air temperature, it is believed that the air temperatur at this location wad hae been lawer than the offeecial record lawest air temperatur o −89.2 °C. A warld cairt shawin auries wi Köppen BWh (het desert climate). The temperaturs in thir regions hae the potential tae exceed 50 °C (122 °F) during the hettest saisons. Cameroon 47.7 °C (117.9 °F) Kousseri ? 45 °C (113 °F) Estanzuela, Zacapa ? Andorrae 38.5 °C (101.3 °F) Andorra la Vella ? *Temperatur reached on multiple occasions; this is the maist recent. †There are a few reports o temperaturs higher than this during phenomena kent as heat bursts, includin a report o 87 °C (188 °F) in Abadan, Iran in Juin 1967. These temperaturs hae never been confirmed, an are nae recognized as warld records. The umwhile heichest offeecial temperatur on Yird, held for 90 years bi ‘Aziziya, Libie, wis de-certified bi the WMO (Warld Meteorological Organisation) in January 2012 as the record for the warld's heichest surface temperatur (this temperature o 57.8 °C (136 °F), registered on 13 September 1922, is currently considered tae hae been a recorder's error). Christopher C. Burt, the wather historian writin for Weather Underground who shepherdit the Libie reading's 2012 disqualification, believes that the 1913 Death Valley readin is "a myth", an is at least fower or five degrees Fahrenheit too heich, as do other weather historians Dr. Arnold Court and William Taylor Reid. Burt proposes that the heichest reliably recordit temperatur on Yird is still at Death Valley, but is instead 53.9 °C (129 °F) recordit five times: 20 Julie 1960, 18 Julie 1998, 20 Julie 2005, 7 Julie 2007, an 30 Juin 2013. ‡On 16 Januar 1889, a temperatur o 53 °C (128 °F) wis recorded at Cloncurry, Queensland. It was measurt wi a non-staundart thermometer, so it is unkent if this readin was valid or nae. The readin is nae recognised bi Australie's Bureau o Meteorology. Fastest temperatur rise: 27 °C (49 °F) in twa minutes; Spearfish, Sooth Dakota, 1943-01-22. Maist consecutive days abuin 37.8 °C (100 °F): 160 days; Marble Bar, Wastren Australie frae 31 October 1923 tae 7 Aprile 1924. Surface temperatur: Heat records are measurt bi air temperature abuin the grund. Remote sensin can estimate grund or "skin" surface temperaturs: the MODIS satellite foond in a brief survey a grund temperature o 70.7 °C (159.3 °F), in the Lut Desert o Iran, the hettest detectit. Bangladesh 2.8 °C (37.0 °F) Sreemangal 1968-?-? −11.5 °C (11.3 °F) Olintepeque, Quetzaltenango ? * This temperature is considered the lawest ever offeecially recorded in Antarctica an in the Warld, as it was perceived bi grund-poseetioned thermometers in 1983. Satellite analyses made in 10 August 2010 pyntit tae a temperatur o −93.2 °C (−135.8 °F) near Dome F in Queen Maud Land, but this record is nae offeecially leetit because it wis measurt bi remote sensin methods that are nae totally consistent, unlik the 1983 temperatur. See Lawest temperatur recordit on Yird for details. Fastest temperatur drop: 27.2 °C (49 °F) in 15 minutes; Rapid City, Sooth Dakota, 1911-01-10. Least per year (locale): 0.2 millimetres (0.0079 in) per year or less, Quillagua, Antofagasta Region, Chile. Maist in ane minute: 38 mm (1.5 in); Barot, Guadeloupe, 26 November 1970. Maist in ane oor: 305 mm (12.0 in) in 42 minutes. Holt, Missouri, Unitit States, 22 Juin 1947. Maist in 12 oors: 1,144 mm (45.0 in); Cilaos, Réunion, 8 Januar 1966, during tropical cyclone Denise. Maist in 24 oors: 1,825 mm (71.9 in); Cilaos, Réunion, 7–8 Januar 1966, during tropical cyclone Denise. Maist in 48 oors: 2,493 mm (98.1 in); Cherrapunji, Meghalaya, Indie, 15–16 Juin 1995. Maist in 72 oors: 3,929 mm (154.7 in); Commerson, Réunion, 24–26 Februar 2007. Maist in 96 oors: 4,869 mm (191.7 in); Commerson, Réunion, 24–27 Februar 2007. Maist in ane year: 26,470 mm (1,042 in); Cherrapunji, Meghalaya, Indie, 1860–1861. Heichest average annual tot: 11,872 mm (467.4 in); Mawsynram, Meghalaya, Indie. Maist in ane-year period: 31.5 meters (102 ft); Mount Rainier, Washington, United States, 19 Februar 1971 tae 18 Februar 1972. Maist in ane saison (1 Julie – 30 Juin): 29.0 meters, (95 ft); Mount Baker, Washington, United States, 1998 throu 1999. Maist in ane calendar month an greatest snow depth in North Americae: 990.6 cm (390 inches) o snaw fell in Tamarack, Californie in Januar 1911, leadin tae a snaw depth in Mairch o 1145.5 cm (451 inches). Fastest ever recorded: 484±32 km/h (301±20 mph) 3-second gust; Observed bi a DOW (Doppler On Wheels) radar unit in a tornado near Oklahoma City, Oklahoma on 3 Mey 1999. Fastest recorded wi an anemometer: 113.2 m/s or 407 km/h (253 mph) 3-second gust; ane of five extreme gusts during a series of 5-min time periods; Barrow Island (Western Australia), 10 Aprile 1996, during Cyclone Olivia. Fastest recorded wi an anemometer ootside a tropical cyclone: 372 km/h (231 mph) sustained 1-minute average; Mount Washington, New Hampshire, 12 Aprile 1934. Fastest daily average: 174 km/h (108 mph); Port Martin (Adélie Land), Antarctica, 24-oor period frae 21 Mairch 1951 tae 22 Mairch 1951. The Tri-State Tornado haulds mony records, includin the langest kent tornado track, fastest speed for a signeeficant tornado, an the deadliest tornado ootside o Bangladesh. On Yird: Approximately 1300 daiths; Manikganj Destrict, Bangladesh on 26 Aprile 1989. In North Americae: 695 daiths (Tri-State Tornado); Missouri, Illinois, Indiana, United States 18 Mairch 1925. Lairgest an maist severe: The Aprile 25–28, 2011 tornado outbreak: 207 confirmed tornadoes occurred in a span o 24 oors, wi a tot o 337 occurrin throuoot the duration o the ootbreak. Thay affectit sax US states, an includit 11 EF4s an 4 EF5s. Most intense ever recorded: 870 hPa (25.63 inHg); ee o Super Typhoon Tip ower the Pacific Ocean, 12 October 1979. Maist intense in the Wastren Hemisphere: 882 hPa (26.05 inHg); ee o Hurricane Wilma, 19 October 2005. Maist intense ever recordit on laund: 892 hPa (26.35 inHg); Craig's Key, Florida, ee o the Labor Day Hurricane, 2 September 1935. While ither laundfawin tropical cyclones potentially haed lawer pressurs, data is vague frae auries ither nor the Atlantic basin, especially afore the invention o wather satellites. Hiviest offeecially recordit: 1.02 kg (2.25 lb); Gopalganj Destrict, Bangladesh, 14 Aprile 1986. Lairgest diameter offeecially measurt: 20 cm (8.0 in) diameter, 47.3 cm (18.625 in) circumference; Vivian, Sooth Dakota, 23 Julie 2010. Lairgest circumference offeecially measurt: 47.6 cm (18.75 in) circumference, 18 cm (7.0 in) diameter; Aurora, Nebraska, 22 Juin 2003. Langest lichtnin bolt: 190 km (120 mi) 13 October 2001. Maist strikes per year: Mair than 70/km2 in pairts o Central Africa, especially the Democratic Republic o the Congo. On Dec. 29, 2003, a warld-record UV index o 43.3 wis detectit at Bolivia's Licancabur volcano. Heichest air pressur ever recorded (abuin 750 meters): 1084.8 hPa (32.03 inHg); Tosontsengel, Khövsgöl Province, Mongolia, 19 December 2001. This is the equivalent sea-level pressur; Tosontsengel is locatit at 1,300 metres (4,300 ft) abuin sea level. The heichest adjusted-tae-sea-level barometric pressur ever recordit (ablo 750 meters) wis at Agata, Evenhiyskiy, Roushie (66°53’N, 93°28’E, elevation: 261 m (856.3 ft)) on 31 December 1968 o 1,083.3 hectopascals (hPa) (31.99 inHg). The discrimination is due tae the problematic assumptions (assumin a staundart lapse rate) associatit wi reduction o sea level frae heich elevations. ↑ The lowest unofficially measured temperature in Slovenia was recorded at Komna on 9 January 2009 and reached −49 °C (−56 °F). ↑ 1.0 1.1 1.2 p. 855-857, Satellite Finds Highest Land Skin Temperatures on Earth, David J. Mildrexler, Maosheng Zhao, and Steven W. Running, Bulletin of the American Meteorological Society, July 2011, pp. 855-860, doi:10.1175/2011BAMS3067.1. ↑ Table 9.2, p. 158, Dryland Climatology, Sharon E. Nicholson, Cambridge University Press, 2011, ISBN 1139500244. ↑ A possible warld record maximum naitural grund surface temperatur, Paul Kubecka, Weather, 56, #7 (July 2001), Weather, pp. 218-221, doi:10.1002/j.1477-8696.2001.tb06577.x. ↑ Coldest spot on Earth identified by satellite, Jonathan Amos, BBC News, 9 December 2013. ↑ The Coldest Place on Earth: -90°C and below from Landsat 8 and other satellite thermal sensors, Ted Scambos, Allen Pope, Garrett Campbell, and Terry Haran, American Geophysical Union fall meeting, 9 December 2013. ↑ "NCDC Global measured extremes". Retrieved 6 November 2007. ↑ World: Highest Temperature World Meteorological Organization Retrieved 13 September 2012. ↑ 9.0 9.1 "Doubts Cloud Death Valley's 100-year Heat Record". Retrieved 30 December 2013. ↑ "Private Tutor". Infoplease.com. Retrieved 29 January 2012. ↑ By, Forecast. "Greenland soars to its highest temperature ever recorded, almost 80 degrees F". Washington Post. Retrieved 2 August 2013. ↑ 14.0 14.1 Hottest air temperatures reported on Earth Weather Underground. Retrieved 20 September 2012. ↑ 16.00 16.01 16.02 16.03 16.04 16.05 16.06 16.07 16.08 16.09 16.10 16.11 16.12 16.13 16.14 Masters, Jeff (7 August 2010). "Bolivia ties its all-time heat record". Weather Underground. Retrieved 26 June 2011. ↑ "Details of the temperature, rainfall and wind extremes recorded in SA". South African Weather Service. Retrieved 26 June 2011. ↑ Masters, Jeff (2012-01-15). "2012: Earth's 10th warmest year on record, and warmest with a La Niña - New country and territory hottest temperature records set in 2012". Weather Underground, Jeff Masters. Archived frae the oreeginal on 2013-01-17. Retrieved 2014-08-18. ↑ Burt, Christopher (2010-10-22). "2012: Hottest air temperatures reported on Earth". Weather Underground, Jeff Masters. Retrieved 2014-08-18. ↑ "Bangladesh records highest temperature 42.2 degree Celsius in last 14 years". Asian Tribune. 2009-04-27. Retrieved 3 September 2012. ↑ Passang Norbu (14 June 2013). "The heat has got into the Himalayas". Kuensel. Retrieved 2 March 2015. ↑ India Meteorological Department. "Ever recorded Maximum temperature, Minimum temperature upto 2010". India Meteorological Department. Retrieved 21 May 2013. ↑ "Temperature history for Tallil, Iraq". Weather Underground. Retrieved 7 January 2014. ↑ Burt, Christopher C. "August 2011 Global Weather Extremes Summary". Weather Underground. Retrieved 7 January 2014. ↑ 27.0 27.1 27.2 "former National Rankings". Japan Meteorological Agency. Retrieved 13 August 2013. ↑ "Oceania: Highest Temperature". ASU World Meteorological Organization. 1967. Retrieved 10 June 2011. ↑ "Wunder Blog". Weather Underground. 19 July 2010. Retrieved 28 January 2011. ↑ "Climate of Korea". Korea Meteorological Administration. Retrieved 24 July 2010. ↑ "Temperature hits 38.7℃ , breaks 82-year-old record". Taipei Times. Retrieved 1 July 2013. ↑ 33.0 33.1 "Thai Meteorological Department". Thai Meteorological Department. ↑ 34.0 34.1 "Sıkça Sorulan Sorular – Meteoroloji Genel Müdürlüğü". Dmi.gov.tr. Retrieved 20 August 2010. ↑ 35.0 35.1 35.2 35.3 35.4 35.5 35.6 35.7 35.8 Global Measured Extremes of Temperature and Precipitation. National Climatic Data Center. Retrieved 21 June 2007. ↑ 36.0 36.1 "Australian Temperature Extremes" (PDF). Bureau of Meteorology. 1 April 2009. Retrieved 16 December 2009. ↑ "50.5 °C – W.A. 's Highest Ever Temperature". Bureau of Meteorology. 20 February 1998. Retrieved 12 July 2011. ↑ "Carl Walrond. 'Natural environment', Te Ara – the Encyclopedia of New Zealand, updated 25-Sep-2007". Teara.govt.nz. Retrieved 20 August 2010. ↑ "Servicio Meteorólogico Nacional (Argentina)". Retrieved 31 March 2014. ↑ "Piauí tem a temperatura mais alta em 96 anos (Piauí has the highest temperature in 96 years)". Terra. 26 November 2005. Retrieved 1 October 2010. ↑ "Extreme High Temperature in Venezuela". wunderground. Retrieved 16 October 2012. ↑ "ARECIBO 3 ESE, PUERTO RICO – Climate Summary". Sercc.com. Retrieved 29 January 2012. ↑ 49.0 49.1 49.2 49.3 49.4 49.5 49.6 49.7 49.8 49.9 "Global Weather & Climate Extremes". World Meteorological Organisation. Retrieved 25 September 2010. ↑ "Neuer Hitze-Rekord: 40,5°C in Bad Deutsch-Altenburg". ZAMG. 9 August 2013. Retrieved 9 August 2013. ↑ 51.0 51.1 "Bulgaria Second National Communication" (PDF). Retrieved 20 August 2010. ↑ 53.0 53.1 "Česká republika – Česká nej". atlasceska.cz. Retrieved 20 August 2012. ↑ 55.0 55.1 "EMHI". Emhi.ee. 11 August 1992. Retrieved 20 August 2010. ↑ "Kaikkien aikojen lämpöennätys rikki Liperissä: 37,2!". Iltasanomat.fi. Retrieved 20 August 2010. ↑ "Wetterrekorde - Lufttemperatur". DWD. Retrieved 6 July 2015. ↑ 59.0 59.1 "Website of the Hungarian Meteorological Service". Met.hu. Retrieved 20 August 2010. ↑ 60.0 60.1 Einarsson, Markús. Climate of Iceland pg 683. Retrieved 29 April 2009. ↑ Heat Wave Hits Iceland, New Records Set Iceland Review 2008-07-31. Retrieved 29 April 2009. ↑ 62.0 62.1 "Temperature – Climate – Met Éireann – The Irish Meteorological Service Online". Met.ie. 2 January 1979. Retrieved 20 August 2010. ↑ "BATTUTI I RECORD DI CALDO: Italia del Sud nella fornace africana, punte di +47 °C". Meteogiornale. 25 June 2007. Retrieved 8 May 2014. ↑ "Il record italiano di caldo: +48.5 °C". CentroMeteoToscana. 7 July 2012. Retrieved 8 May 2014. ↑ 66.0 66.1 "(Meteorologiniai rekordai Lietuvoje)". meteo.lt. Retrieved 20 August 2010. ↑ "Climate in DEMIR KAPIJA in July 2007 - Historical weather records". Tutiempo.net. Retrieved 4 September 2012. ↑ 69.0 69.1 Masters, Jeff. "2012: Earth's 10th warmest year on record, and warmest with a La Niña". Weather Underground. Retrieved 17 January 2013. ↑ 71.0 71.1 "Klima". met.no. Retrieved 20 August 2010. ↑ 72.0 72.1 "Zakład Klimatologii – Uniwersytet Jagielloński, Kraków". Klimat.geo.uj.edu.pl. Retrieved 20 August 2010. ↑ "Погода и Климат – В России установлен новый абсолютный температурный максимум". Pogoda.ru.net. Retrieved 28 January 2011. ↑ 76.0 76.1 "TEMPERATURE REGIME IN SERBIA, Republic Hydrometeorological Service of Serbia". Hidmet.gov.rs. Retrieved 4 September 2012. ↑ "Rekord: V Hurbanove namerali 40,3 °C" (in Slovak). pravda.sk. Retrieved 20 July 2007. ↑ 80.0 80.1 Temperaturrekord. Swedish Meteorological and Hydrological Institute. Retrieved 19 December 2009. ↑ 81.0 81.1 "Weather in Switzerland". High-end-travel-switzerland.com. Retrieved 20 August 2010. ↑ "Погода и Климат – Климатический монитор: погода в Луганске". Pogoda.ru.net. Retrieved 28 January 2011. ↑ "Heat wave: South Pole hits record high temperature on Christmas Day". United States Antarctic Program. 29 December 2011. Retrieved 1 February 2012. ↑ Burt, Christopher C (2004). Extreme Weather. W. W. Norton & Company. p. 36. ISBN 0-393-32658-6. Retrieved 21 June 2007. ↑ Weather Extremes, Weather Underground - Retrieved 14 September 2012. ↑ "Death Valley's 134F Record Temperature Study Part One". Retrieved 30 December 2013. ↑ Burt, Christopher C. "Hottest air temperatures reported on Earth". Weather Underground. Retrieved 7 January 2014. ↑ Burt, Christopher C. "Summary of Southwest Heat Event through July 2nd". Weather Underground. Retrieved 7 January 2014. ↑ 90.0 90.1 90.2 90.3 90.4 90.5 90.6 90.7 Lyons, Walter A (1997). The Handy Weather Answer Book (2nd ed.). Detroit, Michigan: Visible Ink press. ISBN 0-7876-1034-8. ↑ "Marble Bar heatwave, 1923–1924". Australian Climate Extremes. Bureau of Meteorology. Archived frae the oreeginal on 17 March 2009. Retrieved 21 September 2008. ↑ "Finding the hottest spots on Earth by satellite". Earth Observatory. NASA. 2012-05-02. ↑ Web Team (5 September 2005). "Australian Antarctic Division". Aad.gov.au. Retrieved 20 August 2010. ↑ "Office of Polar Programs". Nsf.gov. Retrieved 20 August 2010. ↑ "Cold claims 8 more". Retrieved 18 January 2013. ↑ "China weather, Weather of China, China weather forecast". Weatherchina.org. Retrieved 20 August 2010. ↑ "An extremely cold winter in Iran". Payvand.com. Retrieved 20 August 2010. ↑ Climatological Means for Iraq, Government of Iraq Meteorological Department, NOAA Central Library, Climate Data Imaging Project, page 29. Retrieved 29 March 2007. ↑ 선종일 (1 August 1942). "Korean Climate". User.chollian.net. Retrieved 29 January 2012. ↑ Luces, Kim (31 January 2014). "'Abnormally cold' temperatures recorded in January". GMA News. Retrieved 2 March 2015. However, these are nothing compared to the all-time lowest temperature ever felt in Baguio City and in the Philippines – the 6.3-degree cold felt on January 18, 1961. ↑ Datos Contenidos en la Base de Datos Climatológica, a Noviembre de 2011, Climatología Estadística, Los Lamentos, Servicio Meteorológico Nacional, México. Retrieved 22 September 2012. ↑ A temperature of -30.4 °C claimed at Villa Ahumada on the same day was not recorded in the town and it was probably an unofficial value recorded in a remote location of the municipality. Temperatures as low as -32 °C reported in the municipalities of Temosachic and Santa Barbara are either dubious and unofficial or plain wrong. Unofficial temperatures as low as -31 °C has been reported on the peak of Cerro Mohinora and -42 °C in Ciudad Madera, Chihuahua. ↑ National Climate Extremes Committee. National Climatic Data Center. Retrieved 11 February 2009. ↑ "Top Ten Montana Weather Events of the 20th Century". National Weather Service Unveils Montana's Top Ten Weather/Water/Climate Events of the 20th Century. National Weather Service. Retrieved 9 March 2007. ↑ "KMI (Belgian Royal Meteorological Institute) site". Kmi.be. Retrieved 29 January 2012. ↑ "Ilmatieteen laitos – Sää ja ilmasto – Ilmastotilastot – Lämpötilaennätyksiä – kk". Fmi.fi. Retrieved 20 August 2010. ↑ "MétéoFrance". Comprendre.meteofrance.com. Retrieved 29 January 2012. ↑ Andreas Wagner (August 2009). "Wetterextreme (Temperaturspanne von bis zu 146,5°C)". MeteoGroup. Retrieved 11 August 2014. ↑ "OnlineFX destination guide to Greece". Onlinefx.com. Retrieved 20 August 2010. ↑ "Record di freddo in Italia: -49.6°C sulle Pale di San Martino". ↑ "Terras da Beira – "Reveillon" português sem chuva, mas a bater o dente de frio" (in Portuguese). 27 March 2014. Retrieved 31 March 2014. ↑ ":: travel to SLOVAKIA". Travel-to-slovakia.biz. Retrieved 20 August 2010. ↑ "Погодные рекорды Украины | Новости Украины | СЕГОДНЯ". Segodnya.ua. Retrieved 20 August 2010. ↑ "Lowest daily minimum temperature records in Northern Ireland". Met Office Weather Extremes. 24 December 2010. Retrieved 14 August 2011. ↑ "Datos extremos en el país y en el mundo" (in Spaingie). Retrieved 31 March 2014. ↑ Boletín Mensual del Tiempo 1946, Bolivia Servicio Meteorológico, NOAA Central Library, Climate Data Imaging Project. Retrieved 27 January 2007. ↑ "Recordes de Frio em SC". Retrieved 17 October 2014. ↑ (in Spaingie) Boletines Anteriores, Junio 2002, Sección de Meteorología del Departamento de Geofísica de la Universidad de Chile. Retrieved 13 June 2007. ↑ (in Spaingie) Con 1,2 grados bajo cero en Asunción, la ola polar llegó para quedarse, La Nación. Retrieved 12 February 2012. ↑ Programa de Capacitación Para la Estimación del Riesgo, Biblioteca Virtual en Prevención y Atención de Desastres (BVPAD). Retrieved 30 August 2009. ↑ "Extreme Low Temp in Venezuela". Wunderground. Retrieved 16 October 2012. NOTE: Pass the cursor over the subrayed record to see the source of this. "This location is probably uninhabited, but is close to the town of San Isidro de Apartaderos. −11 °C (12 °F) has been reported from an uninhabited high altitude at Páramo de Piedras Blancas, Mérida state." ↑ "New minimum temperature record for South Africa". Retrieved 12 June 2014. ↑ "New record for New Zealand's coldest day". TVNZ. 12 July 2011. Retrieved 12 July 2011. ↑ "Climate statistics for Australian locations". Bom.gov.au. Retrieved 20 August 2010. ↑ 138.0 138.1 138.2 "NOWData – NOAA Online Weather Data". National Oceanic and Atmospheric Administration. Retrieved 27 October 2011. ↑ Yap, DJ (25 January 2013). "Zero in Mt. Pulag? Pagasa clueless". Philippine Daily Inquirer. Retrieved 2 March 2015. ↑ Christopher C. Burt. "Time to Update World's Driest and Wettest Locations?". Weather Underground. Retrieved 10 June 2013. ↑ "Service Hydrologique de 1'O.R.S.T.O.M: Intensité extraordinaire de la précipitation du 26 novembre 1970 dans la région des Grands-Fonds de Guadeloupe" (PDF). Retrieved 4 June 2013. ↑ Frank H. Forrester, 1001 Questions Answered about the Weather (ISBN 0486242188), page 235: "The greatest amount of snowfall for a calendar month occurred at Tamarack, California, in January, 1911—390 inches." ↑ Center for Severe Weather Research (2006). "Doppler On Wheels". Retrieved 18 February 2007. ↑ "101 Amazing Earth Facts". SPACE.com. Retrieved 20 August 2010. ↑ "Tornadoes in Bangladesh". Tornadoproject.com. Retrieved 20 August 2010. ↑ "Research: Tornado Extremes". TORRO. Retrieved 20 August 2010. ↑ " "A 39 años del tornado en San Justo, el único F5 en toda Sudamérica y Latinoamérica". Uno Santa Fe. Retrieved 18 March 2014. ↑ National Climate Centre. "Australian Climate Extremes-Storm". BOM. Archived frae the oreeginal on 17 March 2009. Retrieved 3 September 2012. ↑ "Tropical Cyclone Report" (PDF). Retrieved 20 August 2010. ↑ "Extreme Weather: A Guide and Record Book". Extremeweatherguide.com. Retrieved 20 August 2010. ↑ 154.0 154.1 "Appendix I – Weather Extremes" (PDF). San Diego, California: National Weather Service. Archived frae the oreeginal (PDF) on 28 May 2008. Retrieved 1 June 2010. ↑ NWS (30 July 2010). "Record Setting Hail Event in Vivian, South Dakota on July 23, 2010". Aberdeen, South Dakota: National Weather Service. Archived frae the oreeginal on 3 August 2010. Retrieved 3 August 2010. 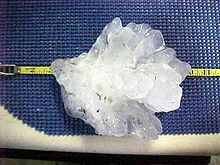 ↑ "Largest Hailstone in U.S. History Found". News.nationalgeographic.com. Retrieved 20 August 2010. ↑ "NASA – NASA Satellite Identifies the World's Most Intense Thunderstorms". Nasa.gov. Retrieved 20 August 2010. ↑ 160.0 160.1 "World: Highest Sea Level Air Pressure Above 750 meters". Arizona State University. Retrieved 7 October 2012. ↑ 161.0 161.1 "World: Highest Sea Level Air Pressure Below 750 meters". Arizona State University. Retrieved 7 October 2012. This page wis last eeditit on 14 Februar 2018, at 18:24.